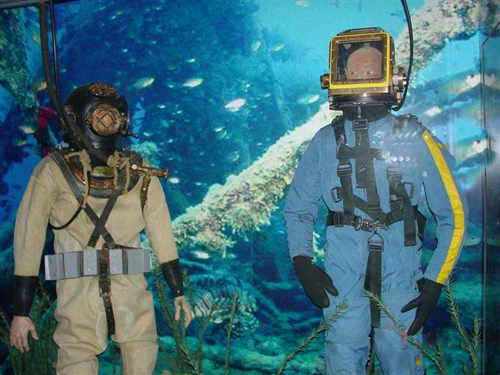 Two mannequins wearing the shallow water gear, right, and the deep water gear, left. Photographs courtesy of Marc Sammis. The staff at the U.S. Army Transportation Museum along with the assistance of the dive team at Fort Eustis, recently completed an exhibit dedicated to Army divers. Although the dive teams are part of the engineer branch, they work frequently with transportation Solders in salvage and clearing ports and submerged obstacles that can be hazardous to the Army’s water and port operations. The Army has two dive companies; the one at Fort Eustis, home of the Transportation Corps, and one stationed in Hawaii. The Fort Eustis company consists of four light teams (74th, 86th, 511th & 544th) and one heavy team (569th), and in Hawaii there is one heavy team (7th). Light teams work in shallow waters wearing shallow water gear while heavy units work in deep water wearing deep water gear. All of the teams have recently worked in Kuwait, Iraq, Louisiana and other areas. The permanent exhibit contains two dive suits, the Mk 12 Surface Supported Diving System used in the 1980s and 1990s, and the MkV Deep Sea Diving Suit used from 1916 to the early 1980s, both of which are now obsolete. They are set up in a tall case with an underwater backdrop produced with help from the Fort Eustis Training Audiovisual Support Center (TASC). A revolving disco ball casts light onto a mirror giving the scene the appearance of underwater refracted light. Sand and junk metal fixtures were added to the bottom. A separate vetrine case holds scuba tanks, a weight belt, a mask and a welding shield. The museum also has a earlier dive suit in its collection that it received in the late 1970s, and the staff is staying in contact with the dive team at Fort Eustis who continue to secure some obsolete diving tools for the museum. Visitor information is available at www.transchool.eustis.army.mil/Museum/Museum.html. The renovated DOVAP antenna at White Sands Missile Range Park. Photograph courtesy of Terrie Cornell. White Sands Missile Range Museum has three wonderful volunteers who recently renovated an antenna in the museum’s outdoor missile park. Two year ago, this 1960s Doppler Velocity and Position (DOVAP) Antenna was moved to the missile park from out on the range, but it needed some TLC. Coincidently, Fred Walters, a devoted museum volunteer and WSMR retiree, designed that DOVAP in the early 1960s. He and his wife Debbie, also retired from WSMR, set about breathing new life into the DOVAP. Thalia Howard, another museum volunteer, turned and shaped twelve new oak arms for the antenna. With a little help from WSMR’s crane operators, Fred and Debbie installed the arms, and then painted the upright support. The DOVAP now resembles its 1965 appearance. 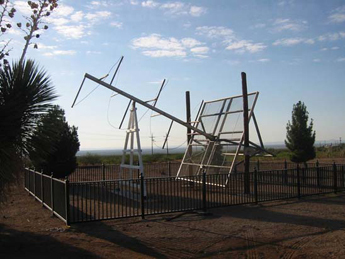 This antenna, like much of the early instrumentation used at White Sands Missile Range, was designed and built there. The DOVAP system provided trajectory data and ground guidance for most of the early rocket systems: Corporal, Sergeant, Honest John, Little John, Redstone, and Aerobee Upper Atmosphere programs. DOVAP was originally developed during World War II by the Germans as part of a V–2 guidance and control system. It traced the course of a rocket using the Doppler effect caused by a target moving relative to a ground transmitter and receiving stations. Unlike radar, the 36.9–megahertz helix antenna did not allow scientists to see the rocket on a screen. Instead, it sent up radio waves, which were received and rebroadcast back to earth by the rocket. The returned waves combined with the original ground broadcast and produced a musical tone which varied with the rocket’s speed–the faster the rocket, the higher the pitch. Thanks to museum volunteers Fred, Debbie and Thalia, this important piece of missile-testing history is spruced up for visitors to enjoy. Congressman Otter, Idaho (left) and Rick Johnson, President, Idaho Military Historical Society, unveil the new exhibit. Photographs courtesy of the museum staff. 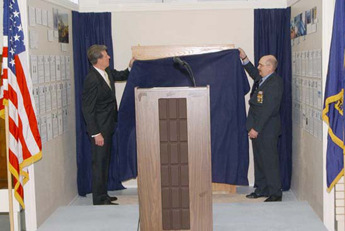 After more than a year of hard work by many people, Landsman Gurdon H. Barter’s Navy Civil War Medal of Honor was presented to the Idaho Military History Museum on National Medal of Honor Day, 25 March 2006, where it was placed on exhibit. Landsman Barter earned the medal while serving aboard the U.S.S. Minnesota during the Civil War battles of December 1864 and January 1865 at Fort Fisher, NC. Barter, who died in 1900, never knew he had been awarded the medal. It remained in the possession of the Navy since the day of issuance, 22 June 1865.
in a posthumous award ceremony. Civil War reenactors were on hand and the Naval Reserve rendered the appropriate military honors along with a color guard. Although the governor of Idaho was unable to attend, he signed a proclamation naming 25 March 2006 as Landsman Gurdon H. Barter Day and encouraged Idahoans to join in this observance by giving support to all efforts to preserve his place in Idaho’s history. Gen. Lafrenz, commanding general of the Idaho National Guard, read the proclamation. Iread Barter’s biography which I researched wrote, and the commander of the Naval Reserve read the Medal of Honor citation. There was standing room only in the museum when Congressman ‘Butch’ Otter along with Rick Johnson, President of the Idaho Military Historical Society, made the presentation and unveiled the new Medal of Honor exhibit. Left to Right: Re-enactors Steve Fields, Harvey Dietz and Mike Hunter attend the opening. In recognition of National Medal of Honor Day, special tributes were also made to other Idaho Medal of Honor recipients. Several family members of past recipients were also present, including Larry Thomason, the great grandson of Philippine Insurrection Medal of Honor recipient, Richard M. Longfellow, who read his great grandfather’s citation. Everyone was moved by the proceedings and many expressed their appreciation to the museum staff for making such an event possible. The museum staff is indebted to many people for their assistance in this joint effort, including Congressman Otter and Mr. Jim Adams, Mr. Mark Wertheimer of the Naval Historical Center and Maj. Jeffrey C. Larrabee of the National Guard Bureau, and the U.S. Navy Reserve for all of their efforts to make this happen. Gen. Richard A. Cody, U.S. Army Vice Chief of Staff, with volunteers. All photographs courtesy of John Kinney. I have been volunteering with a group of greeters and supporters for our troops that are coming home for their Rest and Recuperation (R&R) since May 2004. The program was started to encourage and support the 200–280 troops that come through Dallas-Fort Worth (DFW) Airport each day on their way home for a two week vacation. DFW is one of the Army’s Aerial Port of Debarkation (APOD) facilities. On 4 March 2006, Gen. Richard A. Cody, U.S. Army Vice Chief of Staff, came by to see the program first hand. While there, he presented his Military Challenge Coin for Excellence, to the greeters that were present that day. I was very honored to be one of them. 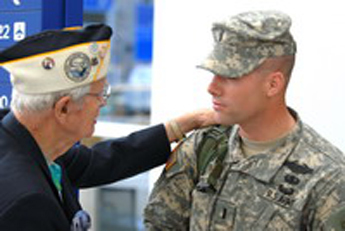 For more information about this program and many more photographs, please visit our website at www.welcometroops.com. Gen. Cody presenting a coin to the author on 4 March 2006. 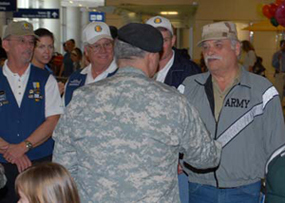 A veteran and volunteer, greeting a young Soldier home on R&R at DFW. 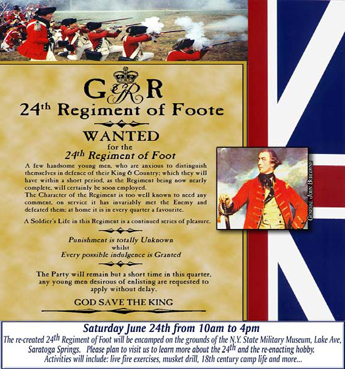 For more information, please contact Michael Aikey or Colleen Maheux at the New York State Military Museum and Veterans Research Center, 61 Lake Avenue, Saratoga Springs, NY 12866, or by telephone at (518) 581-5100. The Army Museum Memo is published bimonthly (except for the Nov/Dec/Jan issue) and distributed to all activities that comprise the Army Museum System. The primary objective of the Memo is to inform Army museums and museum activities of recent developments and operations that may affect the Army Museum Program. The information contained in this publication is provided for the edification of the reader only. In no way shall any information contained herein be construed as a recommendation or endorsement of any product, program, or service.